Software Defined Radio (SDR) is a popular application within the wireless infrastructure market. 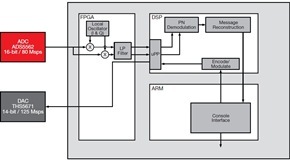 This hardware reference design, leveraging the real time signal processing of the TI DSP and its Universal Parallel Port (uPP), along with TI ADC and DAC, offers SDR algorithm developers a quick platform to enable quick development and demonstration of algorithms and solutions. 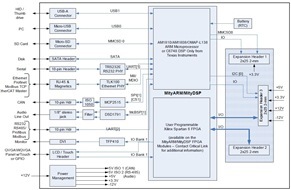 Offers a Software Defined Radio (SDR) platform is based on the MityDSP-L138F System on Module (SOM) from Critical Link, LLC that provides a hardware and software framework designed to accelerate the development of SDR applications. Includes both a Xilinx Spartan 6 FPGA and a TI OMAP-L138 dual core processor, as part of Critical Link’s production-ready MityDSP-L138F System on Module (SOM). Offers an easy interface to OMAP-L138-based SOM. 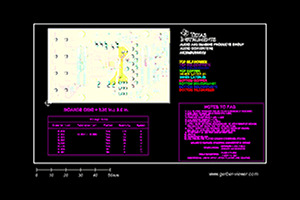 Offers ARM based GUI software.